At the same time, with our stateside 401Ks shriveling, most gringos would like to keep generating as much income as possible, whether we’re retired or not. Many of us need to keep our home fires burning, to keep our credit cards paid. Fortunately, the Hiscocks’ dream of cruising off into the tropical sunset has adapted itself nicely to today’s simpler budgets, casual lifestyles and world connectivity. Also, yacht hulls designed for comfortable coastal cruising between marinas are usually less expensive to own and operate than those built to shoulder through ice bergs and stay at sea for months on end. Yacht cruisers of 1950s would drool for the easy comforts and techno advantages we take for granted in 2010. Rather than being unplugged from reality, cruisers in Mexico are more plugged in than ever. Commuter cruisers can easily keep the wheels of their stateside businesses turning thanks to (a.) cell phone coverage in all ports and many coastal stretches, (b.) inexpensive HF-radio email for mid ocean, (c.) simpler satellite phone services, (d.) fax, phone and internet connectivity ashore, (e.) WiFi in most marinas, and (f.) even hard-wired or secure internet data access in some slips. FedEx and DHL vans scurry around most big ports delivering documents, parts, prescriptions, advertising samples – you name it. And if a personal appearance is required back at the office, international flights reach the U.S. daily. Even the boat no longer needs to head home for annual maintenance and caretaking, thanks to yacht-friendly haul-out yards and marine chandlers, duty free import of critical boat parts, and ample marinas with their growing lists of services tailored for absentee yacht owners. “Yes, we’re what you would call commuter cruisers,” said Sean McDonnagh. I met him and his wife Tanya at a recent boat show in California. “For us, it’s less about disconnecting from reality, more about scheduling flights.” The McDonnaghs, from the Seattle area, had motored their 46-foot trawler down to Mexico six years ago, and although they frequently fly back and forth, their boat has never left. The McDonnaghs each run their own business, she said, and they rely primarily on HF email on board for their business communications while on the boat in Mexico and for scheduling their international lifestyle. “We’ve had no trouble making arrangements this way,” she said. They had recently arranged for stateside guests to fly down and meet them at the next cruising port where they planned to take the boat. Like many commuter cruisers, the McDonnaghs have been commuting together, thus leaving the boat with no crew aboard for increments of three to four weeks. But to do this legally, they must (a.) have a valid Temporary Import Permit, (b.) 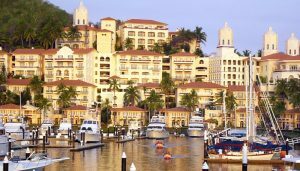 show proof of liability insurance and (c.) berth the boat in one of Mexico’s many bonded marinas, under contracted care, so the marina can take responsibility for the boat’s safety while they’re gone. Marinas offer a wide range of services for absentee boat owners, from daily to weekly or regularly scheduled: check dock lines and fenders, scrub the bottom and waterline, inspect or change zincs, go aboard to ventilate the interior, check the bilges, manually run bilge pumps if necessary, check the refrigeration, hose down the exterior once a week, wash the windows and snap on deck cushions the day the owners are slated to return. 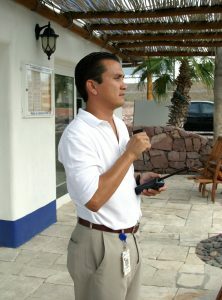 “We’ll pick you up at the airport when you fly back down,” says Gabriel Ley, dockmaster of Marina CostaBaja in La Paz. “If you’re returning to a boat that has no food onboard, we could stop on the way for you to get provisions.” Guardian services for commuter cruisers can be tailored for their needs. For larger, more complicated power boats, it’s not uncommon to hire a local skipper to come aboard daily, run certain equipment, keep it clean in your absence – sometimes the same care-taker skipper year after year. Not everyone in a family or partnership has to participate in the cruise all the time. You can alternate your time onboard, coming and going to enjoy different parts of the overall itinerary, to fit your stateside needs. During the 2007 and 2009 FUBAR powerboat rallies down Baja, several families used this method of commuter cruising. 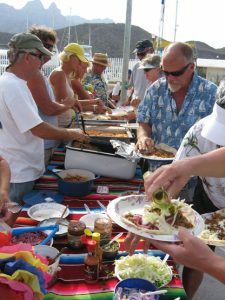 While traveling south with an organized group, each boat load earned membership in the cruising community, forming friendships and learning skills that inevitably benefited the rest of their crew later. For example, let’s say Dad and Son plan to “batch it” to get the boat down to Los Cabos as part of a buddy-boating group that shares a wider experience level than their own. Dad and Son may stop to fish or sharpen their navigation skills en route. Meanwhile, Mom and Daughter may fly into Los Cabos, relax in one of the spas for a few days, and be there to greet the guys when they arrive. Mom and Daughter will be officially added onto the Crew List, join the community and pick up new skills from Dad and Son. Branching off on its own, the whole family may then cruise up toward La Paz, deciding to stop and dive the coral reefs off Cabo Pulmo or hike the trails on Espiritu Santos Island. After enjoying La Paz for a few weeks and sending the kids home from there, Mom and Dad may want to cruise by themselves up the romantic coast to Puerto Escondido. Alternating again, perhaps the kids will replace the parents for the next time period, flying down and staying aboard the boat in Puerto Escondido by themselves for a few weeks – using the boat like a floating condo. However, when it’s time to cross over to the mainland, everyone will probably join up again, helping stand watch on the offshore passage. This alternating method keeps the boat occupied more often than not, which is ideal for a boat that needs regular mechanical attention, and for families who need to take care of elders or children back home on a regular schedule. This works well too for boats owned in partnership, and for large families who can’t all be berthed onboard at the same time. NOTE: Even with Mexico’s streamlined paperwork procedures, U.S. citizens still need to visit the nearest Immigration office before anyone on the current Crew List departs from that port, to avoid a hefty fine and legal problems, also to draw up the new Crew List roster. As wrinkles get ironed out from yacht chartering in Mexico, more commuter cruisers are find that a reasonable alternative to full-time gone-forever cruising. If you plan to stay aboard while summering in the tropics, consider the cost of shore power to keep the air-conditioning running. Conversely, it’s free to anchor in a remote hurricane hole like Puerto Don Juan near Bahia de Los Angeles, but don’t leave a boat unattended in hurricane season. 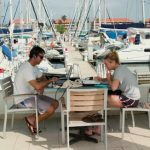 Unplugging from the workaday world is one of the chief reasons why lots of smart boaters chose to cruise in the first place. Mexico will always offer a treasure trove of beautiful remote anchorages where cell phones can’t reach, where you can snooze away a month of tranquil days if you wish. But you don’t need to unplug permanently just to get there. Here are many of the bonded marinas where U.S. boaters can arrange to leave their vessels safely looked after while they depart Mexico for other lands. Each marina has its own prices and lists of services. A valid Temporary Import Permit from customs and liability insurance are required before you commute home. 1. Marina Puerto La Salina, Ensenada. 2. Hotel Coral and Marina, Ensenada. 3. Cruiseport Village Marina, Ensenada. 4. Marina Baja Naval, Ensenada. 5. Marinas de Baja, Cabo San Lucas. 6. Cabo San Lucas Marine, Cabo San Lucas. 7. Marina at Puerto Los Cabos, San Jose del Cabo. 8. Marina CostaBaja, La Paz. 9. Marina Palmira Club de Yates, La Paz. 10. Marina de La Paz, La Paz. 11. Marina Singlar La Paz, La Paz. 12. Marina Fonaport, Puerto Escondido. 13. Marina Singlar Santa Rosalia, Santa Rosalia. 14. Marina Singlar San Felipe, San Felipe. 15. Marina Singlar Puerto Peñasco, Puerto Peñasco. 16. Marina de Peñasco, Puerto Peñasco. 17. Marina Real, San Carlos. 18. Marina San Carlos, San Carlos. 19. Marina Singlar Guaymas, Guaymas. 20. Marina Club de Yates Topolobampo, Topolobampo. 21. Marina El Cid, Mazatlan. 22. Marina Singlar Mazatlan, Mazatlan. 24. Marina Club Nautico, Mazatlan. 25. Marina Singlar San Blas, San Blas. 26. Marina Riviera Nayarit, La Cruz de Huanacaxtle. 27. Paradise Village Marina, Nuevo Vallarta. 28. Marina Nuevo Vallarta, Nuevo Vallarta. 29. Marina Vallarta, Puerto Vallarta. 30. Marina Isla de la Navidad, Barra Navidad. 31. Marina Las Hadas, Manzanillo. 33. Club de Yates de Acapulco, Acapulco.